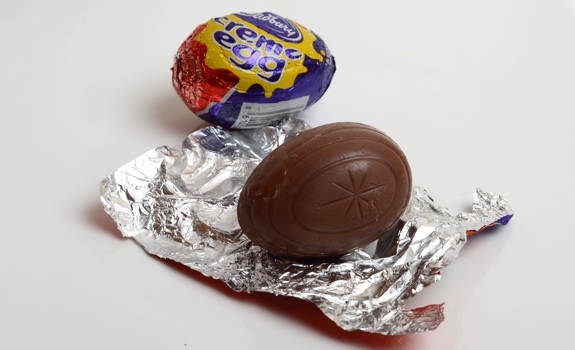 A Cadbury Crème Egg, a.k.a. "cream" egg. The starburst on the side is kinda retro, isn't it? The Look: Once you peel away the colourful foil wrapper, each egg looks (and feels) like a solid egg-shaped chunk of chocolate. But looks can be deceiving. Inside the thick milk chocolate shell, there’s a centre of white sugary goo, with a splash of yellow corn-syrupy goo — like an egg yolk swimming in an egg white. The look is as important as the taste. The Taste: Milk chocolate, and SUGAR. That’s in all-caps for a reason. The filling is extremely sweet, with a texture that’s part liquid and part solid. The “white” is a more solid sort of whipped filling, while the “yolk” is liquid enough to slowly flow out of the centre like honey. Half the fun is the eating process of digging around in the chocolate shell with your tongue, scooping out the filling. The Mess: Not safe for work. Because part of the filling is runny, it tends to get all over your fingers, your lips, and your poor, poor keyboard and/or mouse. You’ll want to wash your hands afterward. 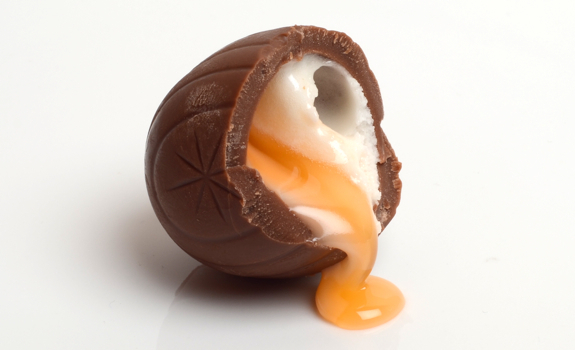 See the yellow filling in the centre of the Cadbury Crème Egg? It's more runny than the white filling. The viscosity is honey-like. Cost: $1 per egg at Bulk Barn. Value for cash money: Good. Each egg may not be as big as a chocolate bar, but it tastes just as sweet. Availability: Grocery stores, convenience stores, pharmacies. Nutrition? : 150 calories per 34-gram egg, based on the U.S. nutritional data. Canadian crème eggs are the same size (34 grams) as American crème eggs, so the Canadian nutritional numbers shouldn’t be significantly different. They’re basically just chocolate, sugar and corn syrup, with a dash of colouring and flavouring. Not health food, in other words. 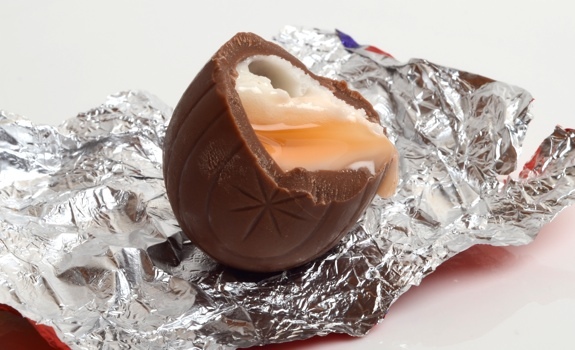 A Cadbury Crème Egg, cracked open, beginning to ooze sugary goo. It's crazy sticky. Love these!! Tastes like childhood Easter. I had my first one of the season a couple of weeks ago sitting in the Vancouver airport. I seem to have no will power when it comes to airport eats–don’t know what it is…maybe it’s about feeling trapped. sorry– got off topic.